In order to merge and replace scenes, you must keep a copy of the master project intact. What is the difference between merging and merging/replacing? When merging a project, two projects are combined into one; each project appears sequentially in the Thumbnails and Timeline views. A merge and replace integrates scene changes back into the master project. Any scenes that were changed are replaced with the new one. As an option, you can keep a copy of the original files for verification purposes. NOTE: When merging projects, the sounds in the master project will now move in order to sync with the panels.The sounds will follow panels based on their name, therefore, it is important to lock scenes and panels names prior to distributing the different scene's extracts, in order to preserve them. Select File > Project Management > Merge and Replace. The Advanced Merge Storyboard dialog box opens. Click Import Project and locate the .sboard file you want to bring in. In the top pane, select the project you want to merge/replace. Use the Move Up and Move Down buttons to organize the projects. In the Select Scenes to Merge section, select the individual scenes to merge/replace. Select the Keep and move original scenes to the end option to retain a copy of the original scenes, which are placed at the end of the master project. The name of the copy is prefixed sequentially by "1_orig" followed by the original scene name. Select the Respect locked audio tracks option to ensure that the locked audio tracks will not be synced during the merge and replace. When deselected, audio tracks will be synched regardless if they were locked or not. 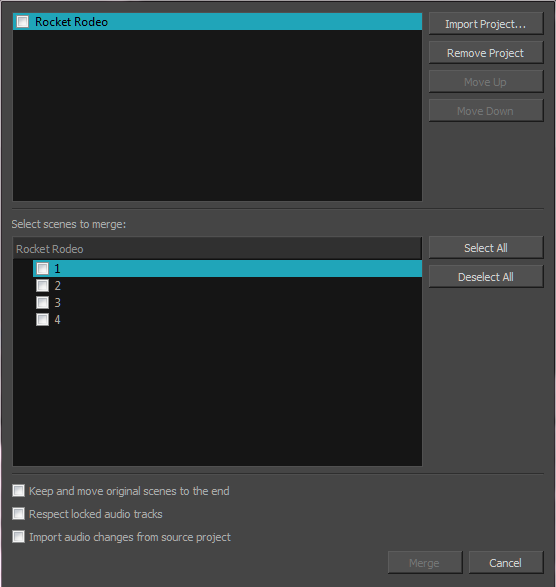 Select the Import audio changes from source project to allow the modifications done in the audio to be applied to the scenes that are replaced.